What is the WordPress Toolbar or Admin Bar and how you can use it to edit WordPress? Originally known as the Admin Bar (introduced in WordPress v3.1), the WordPress Toolbar (WP v3.3) is a solid black bar at the top of your admin area screens. The Toolbar connects the front end (your ‘live’ site) to the back end (your site admin area) of your website and enables you to perform specific functions from either end. It is only visible if you are logged into your admin area Dashboard. Tip: You can enable or disable the Toolbar by going to Users > Your Profile (in the Sidebar) and checking or unchecking the box ‘Toolbar’ – Show Toolbar when viewing site. Click ‘Update Profile’ to save your changes. Note that it is no longer possible to hide the Toolbar when viewing the admin area screens using standard WordPress settings. Some people think the Toolbar is unnecessary but it can save you time by giving you quick access your Dashboard while viewing your live website. It also provides a range of other quick-links which you might find useful too. WordPress logo – Provides links to WordPress documentation and support forums. Website name – Your website name provides quick links for viewing your ‘live’ website or various screens in your Dashboard area. Customize – Introduced in WP v3.4 and depending on your theme, you may have a Customize link which enables you to edit the appearance of your website. Speech bubble – The speech bubble icon is a quick link to your Comments page. + New – The ‘Add New’ drop-down menu is where you can quickly add new posts, media or pages. Once your website is up and running, you may also find other links to different facilities within your WordPress Dashboard admin area. View Page/Post – A quick-link to view the page or post you are currently working on. Your Nickname – In the top right corner of your WordPress Dashboard you will see your Nickname, which is also a drop-down menu where you can access the Editor to edit your Profile or log out. Search bar – The Search icon on the far-right toggles to a Search bar which allows you to search for anything on your website, and is only visible on the front end of your website when you are logged in to your admin area (Dashboard, or back end). The Search bar is not visible in the Dashboard screens. Your Nickname and Avatar – Your Nickname can be unique or the username with which you have logged in to your Dashboard, and is a drop-down menu where you can access the Editor to edit your Profile or log out. The Avatar is your profile picture which can be changed in your Profile via Gravatar. 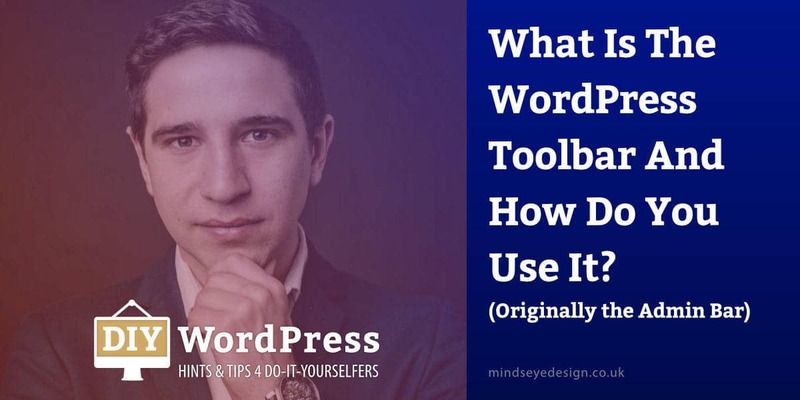 Tip: If you have disabled the WordPress Toolbar, you may be wondering how to get back to your Dashboard! You can use the back buttons on your browser, which is fine if you haven’t explored too far through the site, but the easiest way is to bookmark the Dashboard web address in your browser bar.